Celebrating the new BEST partnership are seated, from left, DeWayne Morrow, Cleveland city president; Sherry Crye, Chamber director of workforce development; and Ron Spangler, Ocoee Middle School principal. Standing are school representatives and students, from left, Brandi Haynie, Holly Dare, Viktoriya Marushka, Allison Adams, Gracie Medley and Kane Ayres. A relationship begun more than 17 years ago has flourished into a new BEST partnership. SouthEast Bank and Ocoee Middle School have re-energized their efforts to reinforce the education process and strengthen the community’s workforce as ongoing BEST partners. BEST, an acronym for Business & Education Serving Together, is a program of the Cleveland/Bradley Chamber of Commerce that pairs a business and a selected school to enhance the quality of life for the community and provide business support for educational programs. DeWayne Morrow, Cleveland city president for SouthEast Bank, worked together with Ron Spangler, OMS principal, more than 17 years ago when in a different banking industry. 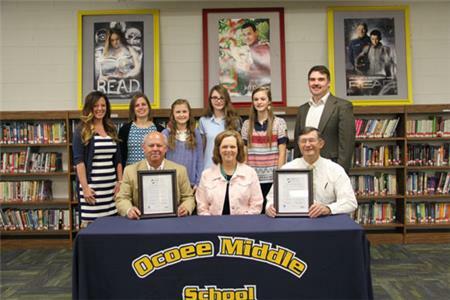 Both by design and through this BEST partnership, OMS will attain its vision to empower all students to achieve their greatest potential, said officials. Principal Ron Spangler stressed, “I believe in the BEST partnership program. Area businesses and schools make great partners. Together we will create a vision for the future of OMS and look forward to exciting new things ahead. Sherry Crye, director of workforce development for the Chamber of Commerce, coordinates the BEST partnership program. According to Ms. Crye, schools in the Bradley County and Cleveland City School Systems have one or more local business partners as part of the BEST program. Private schools that are Chamber members may also participate in the program. For information about the BEST partnership program, call Ms. Crye at 472-6587.